Among so many other things, making sure your dog maintains a healthy weight is an important part of responsible dog ownership. Being overweight or underweight can increase the risk of health problems for your dog and even limit their lifespan. With obesity on the rise in the pet population, dog owners need to know how to make sure their dogs are in shape. Many owners keep track of their dog’s weight by checking it on the scales. Whilst this is a great way to monitor weight, it doesn’t always give a true reflection of your dog’s health. Within breeds, sizes of dogs can vary and some dogs can be heavier than others, even when they’re in ideal condition. So along with weighing your pet regularly, it’s advisable for owners to learn how to Body Condition Score (BCS) their dog. Watch Head Vet Sean show you how to check your dog’s body condition score. Featuring our office dogs Monty, Bambi and Socks. Run your fingers over your dog’s rib cage, on either side of their chest in a head to tail direction. You should be able to feel the ribs with a slight covering of muscle over them, but they shouldn’t be visible, feel like sharp ridges or be poking out. It’s important to really feel them with your fingertips rather than just looking, as many dogs’ coats will hide the ribs from view. If your dog is underweight, their ribs will protrude and feel sharp or bumpy as you run your hands along them. If this is the case, it’ll mean a lower BCS. If your dog is overweight the ribs will be difficult to feel as they will be covered in a layer of fat and muscle. The deeper the ribs are to feel under this layer, the more overweight your dog is and the higher the BCS. Run your hand along your dog’s underside, again from head to tail end and also look at the belly from the side. The belly or undercarriage should start low to the ground where it meets the sternum (or breastbone) at the bottom of the rib cage. Then it should slope higher the further back towards the hips you run your hands on either side. An underweight dog with a lower BCS will have a very pronounced ‘tummy tuck’ up towards the hips and groin region. If the belly droops or hangs down near the floor all the way along and doesn’t tuck up underneath the hips then your dog may be carrying excess weight and have a higher BCS. Looking down on your dog’s waist and hips from above, you should notice that this area is much narrower than the width of the chest and ribcage. A slowly tapering abdomen leading from the wider chest to a narrow waist is the sign of an ideal body condition. An underweight dog will have a noticeably narrow waist and the bones of the hips and spine may be easily visible and can be felt protruding under the skin. The more pronounced these bony projections, the more underweight they are and hence the lower their BCS. In overweight or obese dogs, the waist does not narrow towards the hips. The trunk or abdomen will often be just as wide as the chest, giving them a barrel-shaped appearance. In dogs with a very high BCS, there may even be fat pads at the waist which stick out even further than the width of the chest when viewed from above. Once you’ve assessed all three areas, you can give your dog a score on the scale from 1-5, to truly determine if they are at a healthy weight for their size. If they’re not at an ideal BCS (a score of 3), then you can alter their portions or diet plan to get them back to healthy condition. 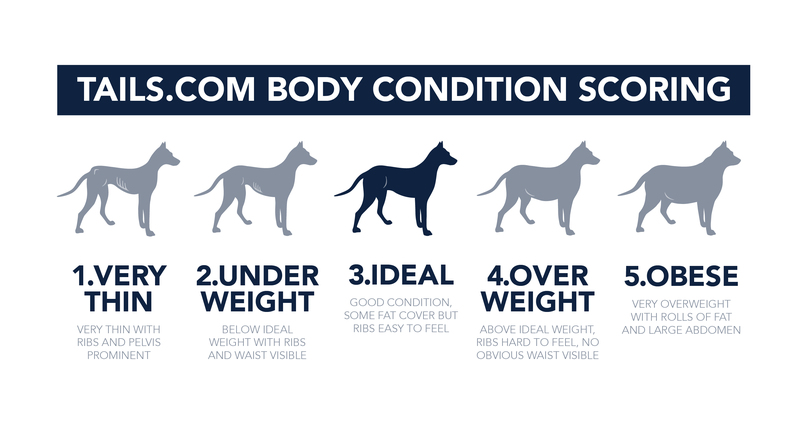 During sign-up at tails.com, we ask you to do a quick Body Condition Score along with telling us their weight and activity level so we can accurately calculate their calorie requirement. This ensures they always remain in a good and healthy condition, which will mean a longer and healthier life for your dog. Like most things, practice makes perfect and practising the Body Condition Scoring will make sure that you know your dog’s ideal condition. If your dog needs a little help getting back in shape, you can edit their body condition on their tails.com profile. We’ll alter their calories and feeding plan to help them get back into shape.